After the Suziki in 1996 stoped with production of GSX-R1100 its position parial adopt GSX-R750. GSX was fighting with other 1000cc bikes. Altough the engine size was a class smaller, on the circuit was bike great and nothing could compare with. Bike was wild and thrilling. But the world turned away from 4 cylinder 750cc - in superbike class started to dominate two cylinder bikes and modern 1000cc, 4 cylinder offered great fun on the roads for average people. Suzuki which in the past determined the rules with models GS1000 and by GSX-R1100 needed 1000cc race replica with sharp chassis and racing geometry. Shortly said: Suzuki needed bigger version of GSX-R750. And thats why GSX-R1000 was born. R1 and Blade were instantly on second place - GSX-R1000 become immediately new etalon of this class. Suzuki was better than any bike in the class. R1 and Blade weren't modernized for this year. Situation looked for loosing the postitions on the market for both bikes. In big number of tests was standing following: GSX-R, R1, CBR. But selling statistics were completely reverse. 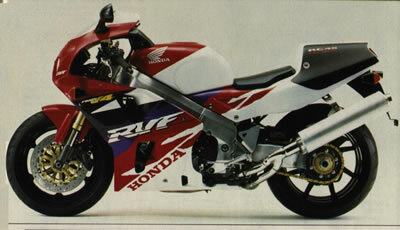 On the top of saleability was still CBR, following by R1 and then GSX-R.